The rainy season that I used to dread as a mother of 4 wild children and a huge dog because they had to stay indoors and be entertained and kept occupied while burning off their inexhaustible energies. It was cold and dark and the humidity palpable. But here it is again and I now look at it from a different vantage point. With grown children who happily entertain themselves, it is a time when flowers rejoice in their daily showers and bloom with gay abandon. The queen of them all in June and July is the glorious hydrangea. How can there be so many shades of blue! It may be Blue & White’s favorite, though we admit to having many. But its range of blues and purples and nearly blacks, its variations of whites and pinks even challenge any artist to match their colorful splendor. They come in many shapes and sizes as well. There is even an Otafuku Ajisai, fluffy with round cheeks. Perfect reflection of Blue & White’s own chubby Goddess of Joy. 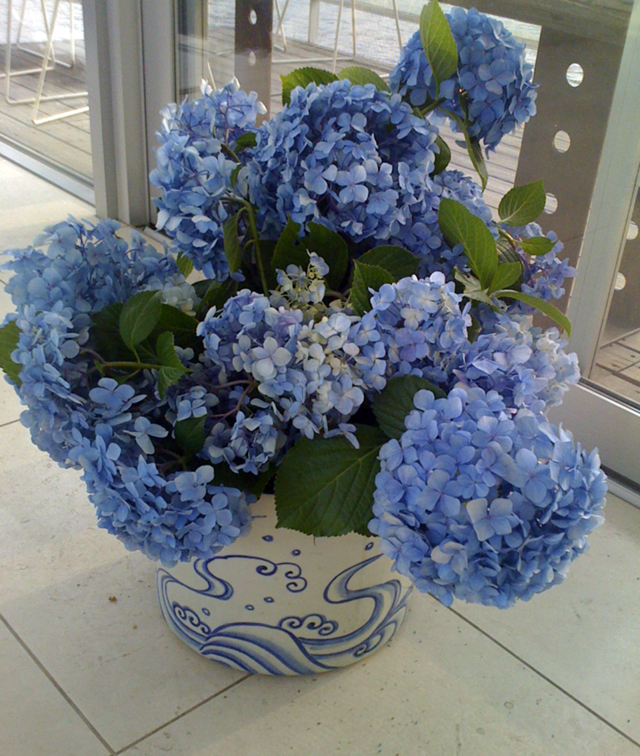 Hydrangeas, or Ajisai in Japanese are the perfect foil to our speciality blue and white pots by Yu Kobayashi above. 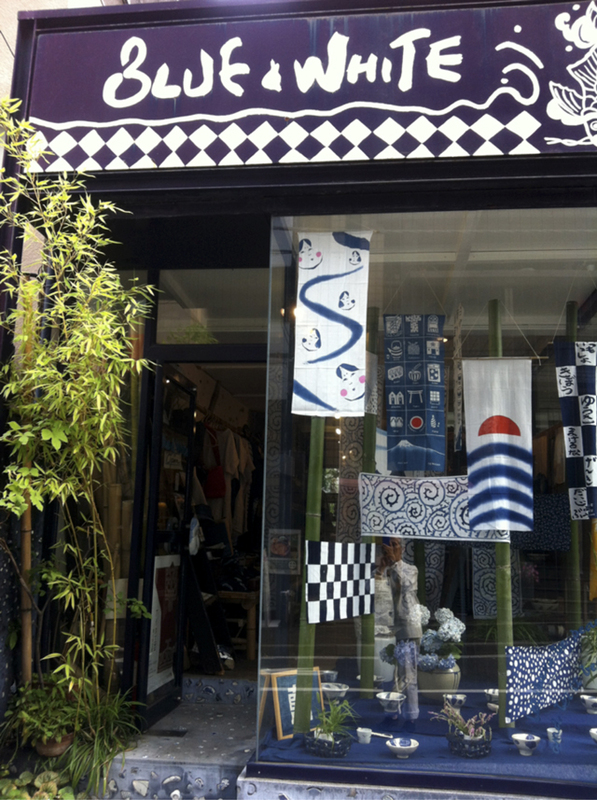 And our own signature Tenugui. TENUGUI, 90 centimeter- 27 inch lengths of hand dyed cotton used as hand towels to mop the brow, tie around the head as a sweat band, wipe the slate clean, or just as a table runner or a dish cloth or a towel to wipe your hands. They are quick spontaneous shouts of color and design, and the dyer has just sent us a delicious array of fresh–from-the-dye-pots blue and white Tenugui. A quaint old Mt. Fuji image – the shape that used to be the classic form of the sacred mountain, was among some old tenugui I found at a flea market years ago and took to the stencil maker to have him replicate it. Its stylized clouds may show a moment of clearing during the rainy season. This charming spotted tenugui is another flea market find. It is a probably a 19th century child’s yukata that once again we had a new stencil cut for. Never quite as rough and heart filled as the old ones, but still a far cry from the designer computer engineered spots that are so in vogue. Checks, spots, stripes, the ever lasting Karakusa pattern, or endless vine, and a beautiful rising sun tenugui – one of my all time favorites taken from an old boys’ day banner. Bringing the old and new together. Finding the ultimate modern in the old and infusing it into the new, giving it a depth and a meaning that are somehow missing in today’s empty designs, that is one of the challenges of Blue & White. That and trying to capture these brilliant blue and white moments that nature blesses us with, especially beautiful during rainy season. I love this post – and your shop. I will be in soon! always something new – but old. Let us know when it comes closer to the day ! Looking forward and will try to have some suggestions for exhibits on at the time. Your updates always make me smile. Just to know that old things are loved and still out there is heart warming. So much to report from Japan ! Old and new alike and the way they combine. Wish I could take photos of that ! Thank you for always writing, Deborah. Oh, how I wish I COULD visit, but, alas, I live in the US. I also wish Blue & White had an online store! and also wish we could have an online store. Alas ! not IT enough to manage. 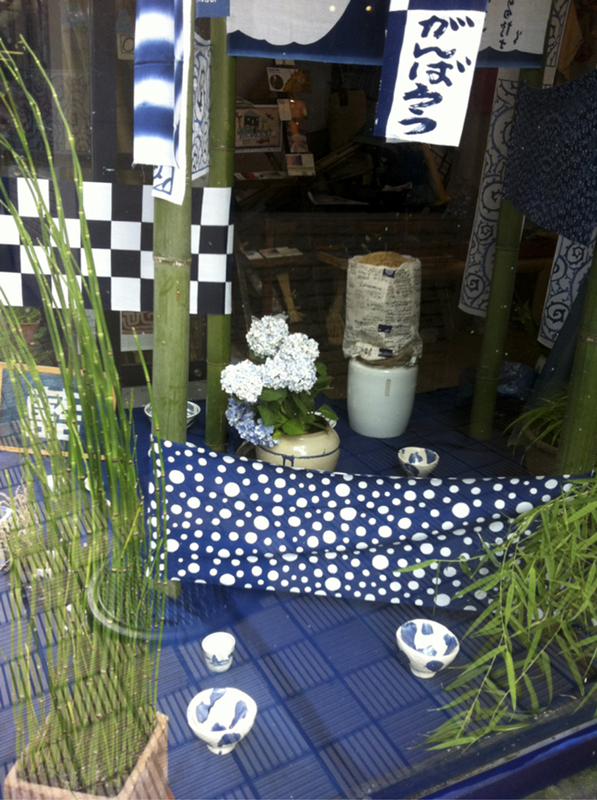 the many visits, gatherings, and events in Blue & White celebrating the traditional values of the Japanese crafts. Wow ! Look who’s here ! Blue & White would never have happened without you ! Still going strong and enthusiastic. Still discovering new Blue & White wonders – this week graceful old glass fishing floats to give cool against the summer swelter. We need you back here ! 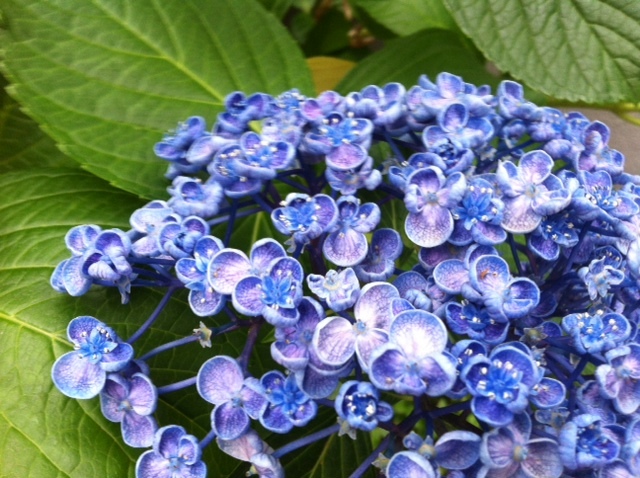 The detail in those hydrangea flowers is incredible, and the range of colours too. I love the old Fuji san tenugui, so naive. Glad the details of the hydrangeas come through, even with my poor camera. And there are so many kinds ! One is Otafuku Ajisai – my favorite of course. 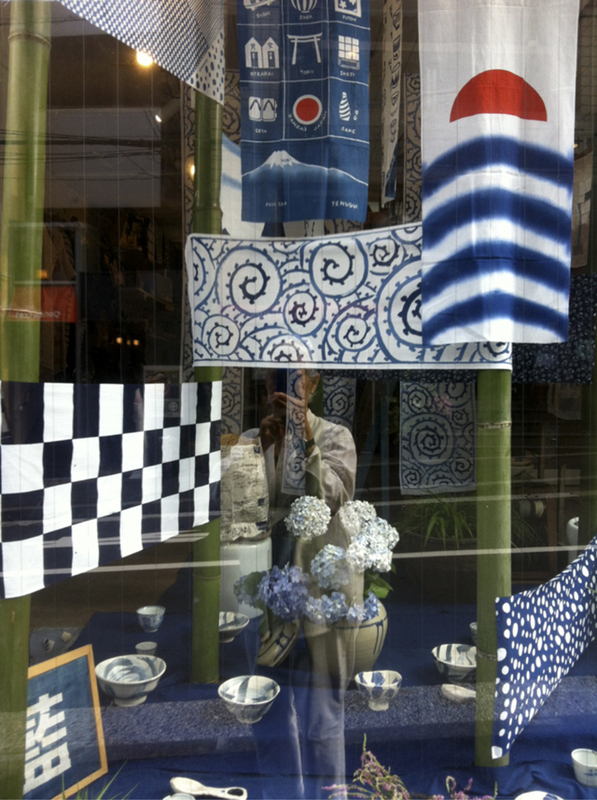 Fuji san has just been made a world heritage site, so the tenugui has had to be reordered again and again. I love its abrupt lines – naive is best ! Always good to hear from you ! I am very disappointed. I faxed an order for several tenugui in June, immediately after this post originally was put online, and I sent credit card information, asking that the items be charged and held. Shop person assured me that they would save items for pick – up at end of July when my husband would again be in Japan. Today he went to pick them up- and there was no record, no saved items, and -worse- no stock left despite assurances by phone that items were in stock and would be saved/charged in advance of pick up., Unfortunately I have to advise that this shop which -in theory- represents much of the wonderful Japanese heritage which has been resurrected in recent years, is no longer being responsive to interested patrons. Staff speak only broken English, do not follow through on promised/statements/orders, and otherwise have degenerated into “tourist” quality. Further, for irritation of businessman/husband, shop did not open at 10:00 as proclaimed on website, but at 11:00. Wonderful idea, but very, very poor followthrough, and likely imminent demise because the concept of this shop is designed to appeal to modern-thinking folks. Sad. I am undone to read of your unhappy encounter with Blue & White ! I am inexpressibly sorry and hope I can do something to rectify this carelessness of Blue & White. 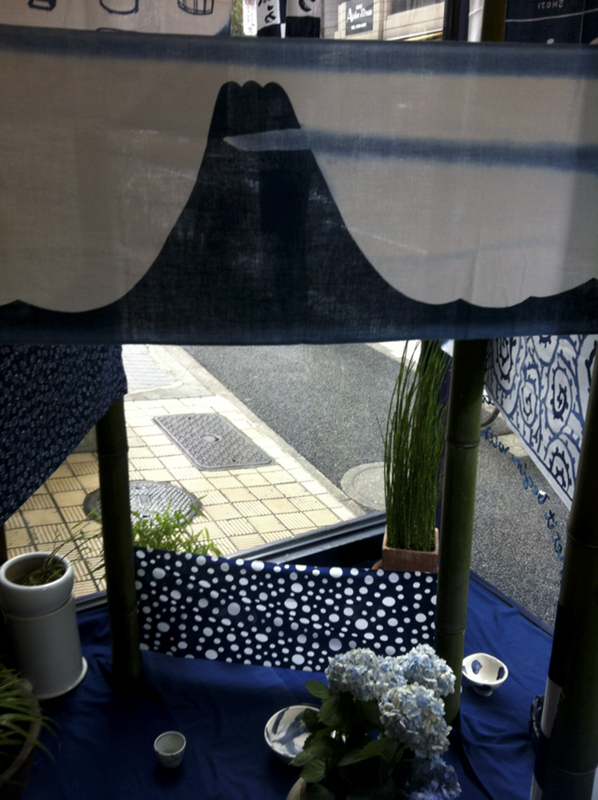 If your husband is still in Tokyo, I will bring the tenugui you ordered to his hotel. If they are not the ones you ordered, we will order them and send them to you. Please tell him how very sorry we are for having come to Blue & White and found it closed! We have changed our opening time to 11 for the summer and certainly should have posted this information on the Blog. We are not like this. Not tourist quality service. 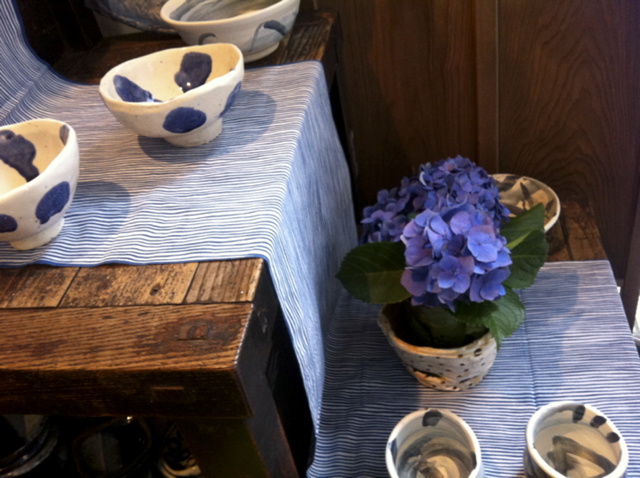 We care mightily about what we are doing and want to make sure every customer is happily connected to the craft tradition of Japan. I have been away this month, but that does not explain such carelessness. I will go to the shop at 11 this morning to find out what has happened and if your husband is still in town, please let me know how I can contact him. If he is, maybe he could take the time/trouble to call me at 090 7424 3961. Please let us correct this inexcusable oversight and help you understand that we are NOt just promises, but sincerely want to make you and all our customers happy and aware of the treasures of Japan.